Mobile applications are increasingly becoming a priority across all business sectors as companies look to extend their services to a population that is using smartphones and tablets. 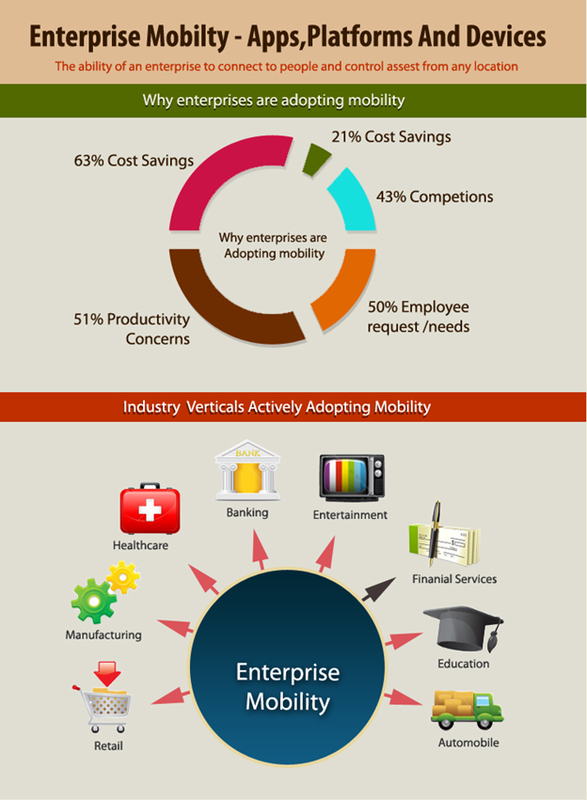 Enterprise mobile application projects are spreading like wildfire. When they deliver value, business leaders in every department seem to want more and that’s when the bottleneck happens. Instead of connecting one data source to one type of mobile device, your IT infrastructure is faced with multiple device platforms, complex security issues, and disparate enterprise applications and data sources many with no API. Enterprise Mobile Applications are enabling businesses to maximize employee productivity regardless of the location or time, bringing to reality a truly mobile workforce. Omkarsoft provides robust, feature-rich mobility development services for enterprises that need to manage multiple mobile applications for a variety of back-end data sources through secure interconnections. We offers the fastest way to create enterprise mobile applications. Our developers help connect and exchange data from websites, databases and industry-leading applications via graphical modelling of Mobile Business Objects. Our team develops solutions for your entire organization through consistent, scalable and adaptable platforms. We specialize in developing compelling applications for businesses and consumers with rich user experiences and intuitive interfaces. We are not confined to developing a single type of application as we create mobile apps for multiple mobile operating systems. Our professional are proficient enough to offer apps for business, entertainment, lifestyle, and much more. Omkarsoft specializes in building cross-platform solutions so that employees, partners and customers are seamlessly and securely connected to your existing infrastructure — regardless of the technologies involved. Our aim is to deliver the Smartphone apps to our clients that can actually bring high efficiency for their business and generate brand awareness of their services & products. Either you aspire for hybrid or native mobile apps, we equip your business with the most user-friendly applications.